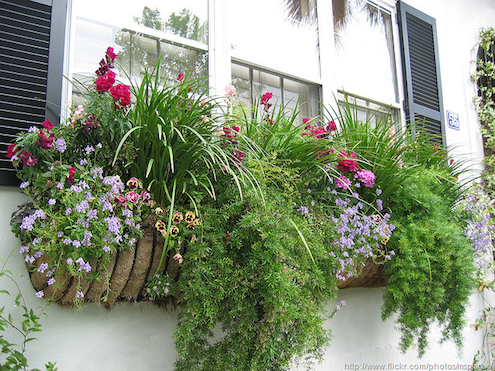 Window boxes can really amp up a home’s curb appeal by adding color and a sense of welcome. Here are some tips for creating eye-catching cascades of color all season long. First, the box should be about the same width as your window. Make sure it has drainage holes, and consider using a metal or plastic liner inside. That extends your box’s life and makes it easier to swap in a seasonal replacement. Next, select plants appropriate for the amount of sun your window boxes will get. Aim for a mix of textures and heights and an overall symmetrical layout. Start with a tall central focus, like spiky dracaena or shoots of salvia; fill in with medium-height stunners like coleus or pansies; and finish with dramatic spillovers like ivy or trailing petunias. Play with arrangements of your plants at the garden store before you buy to be sure they work together. Don’t use plants so tall that they’ll block your view, and don’t go plant crazy. For maximum impact, use just a few varieties in colors that suit your exterior. Then water frequently, and don’t forget to feed and deadhead, so those flowers flourish all summer long.